Alternative – Goth – Just a Phase? A central pillar of commencing my research has been the identification of the term ‘Goth’ as being a culturally acceptable moniker for the broader phenomenon of the Gothic subculture and its various subsets. As discussed by Sweet, there is an apparent shortage of empirical and interview data from which to analyse and extend discourse on the Goth subculture and its participants; this research project seeks to contribute to rectifying this deficit. Survey reply volumes received to date well exceed my initial estimates for responses; consequently appropriate analysis of compiled data will take considerable time. In obtaining a high response rate I hope to best represent the subculture, statistically, and provide an extensive account of and insights into the personal, social and stylistic motivations of the scene. Prior to writing the surveys for this study, I invested much time and consideration into finding the right words to describe the subculture and its participants. Among my initial methodologies was surveying myself and assessing my own attitudes and feelings towards the terminology used by, for, about and on the subculture before talking further about those terms with friends and acquaintances in the scene. Chief among my decisions was a definitive “No Gothic” approach. As described in the brief ‘notes on terminology’ provided at the start of my surveys, my own reading of the term Gothic is very much to do with identifiable periods of historical aesthetics, architecture and the Gothic revivalist tradition of the 19th century. All these feature heavily in the Goth subculture, and are indeed critical in defining its style, design and aesthetics. However, for me, Goth is not Gothic. Goth exists in its own right as a personal style, an identity signifier, quite distinct from architecture or literary genres. Goth, in my view, has consummately established itself to such an extent that it can be viewed as its own phenomenon, its own thing beyond a subculture – a culture. When writing my research questions, I was acutely aware that my positioning of Goth in all its forms as a discrete phenomenon may not be shared by all my fellow scene participants, and would most likely be challenged academically. In the interests of stimulating debate and furthering discussions on the notion of Goth as a culture which extends its importance throughout life, I felt this distinction was, and is, warranted. 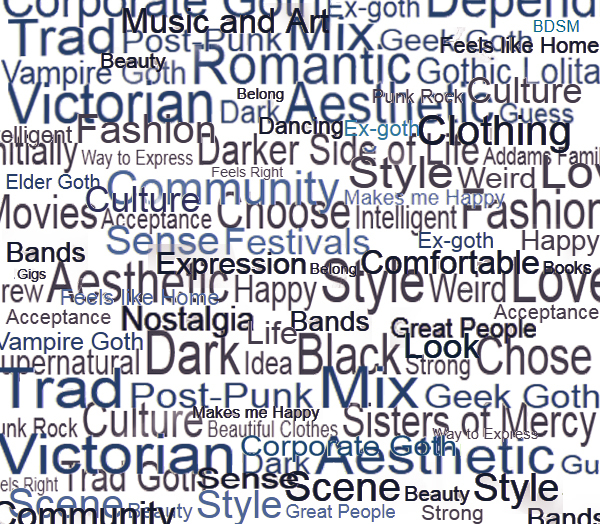 As the first point of enquiry, my surveys ask respondents to chose a Goth aesthetic with which they most identify, respondents are further asked to describe the subculture and provide terms they most associate with the subculture. Since commencing analysis of the initial response data, patterns are emerging which reveal the complexity of terminology used within the culture, and reflect the ongoing struggle of participants to self-identify using consistent catch-all terms or even a common set of terms. Respondents exhibit a genuine desire to contribute to the discussion and understanding of the culture and its motivations, providing detailed personal accounts of their involvement in the culture and applying intellectual rigour to their answers to ensure their notions of subcultural identity are unambiguous. Rather than engaging in a collective “quasi-nostalgia for an imagined past” participants appear to fully engage with efforts to authentically portray the culture and consistently express a desire to provide credible representations of the stylistic choices made when adopting such a recognisable subcultural identity. That the subculture can withstand such critique from within, illustrates the level of maturity reached by the culture and the conviction of some participants in its constancy beyond a youthful experiment. 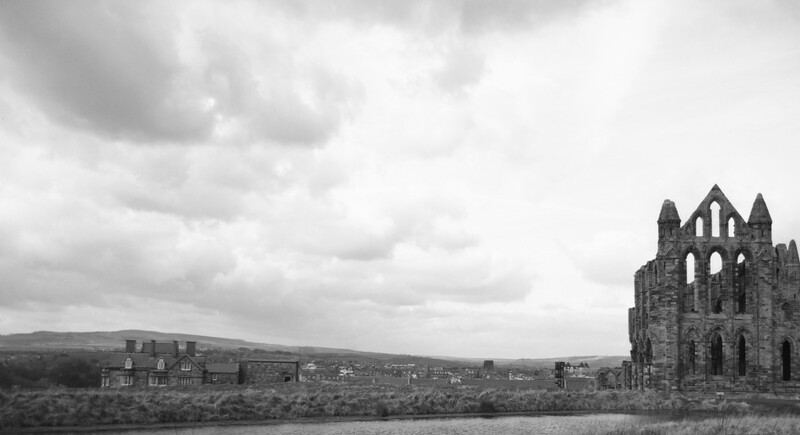 The data to date demonstrates participants’ capacity to cogently self-analyse their relationships with Goth, as well as articulating a genuine desire to provide a measured and truthful description of stylistic and social convictions of the culture. In considering early data snapshots it is apparent the notion of conscious, individualised and considered self-identification is fundamental to participants. When provided with a list of seventeen recognised Goth aesthetics (or identity types) a significant proportion of respondents chose option 18 (‘other’ response category) and provided their own authentic interpretation of Goth. A demonstration of the significance respondents place on terminology can further be seen in the vocabulary used by participants to describe their image, subcultural style and identity (as per the illustration above). Preliminary analysis of free-text responses has demonstrated respondents have a thorough understanding of the social and cultural implications of their active association with an ‘outsider’ culture. Additionally, several respondents have made direct email contact to elaborate further on their answers and provide clarification on terminology in relation to social interactions and beliefs in order to ensure suitable labels are applied to Goth identity in public discourse. Goth subculture, like any other social group, relies on its own unconscious/unspoken rules and conventions, social etiquettes and visual signifiers to communicate belonging. The broad spectrum of striking apparel evident in the now decades old scene, promotes stylistic flexibility within the culture, and allows participants to experiment with different images without abandoning fundamental Goth sensibilities. The “sense of theatre… created and enhanced by the diversity of costumes and looks” that the subculture now fosters, enables participants to embody varied incarnations of their Goth persona and express individualised interpretations of Goth style without losing that necessary sense of belonging to the culture. That Goth culture sustains such a diverse range of distinct ‘types’ of Goths is testament to the scene’s ability to adapt, embrace and indulge different passions and preoccupations – however we label them.